Each person in a relationship often brings their own set of assets and liabilities to the mix when a couple gets together. While the ultimate goal in many marriages is to integrate the life of each spouse into one cohesive unit, individual assets may never qualify as marital, which has a direct impact on the property available for division in divorce. However, just because the underlying asset is not subject to division, any appreciation in value that occurred during the marriage may be. Further, even non-marital assets that were brought into the marriage can become marital for purposes of divorce if the actions of one or both spouses result in the property providing a benefit to the couple or being benefited by the marriage. In other words, property division can quickly become quite complicated, but it is the center of many divorce cases because of the financial security these assets represent. Thus, spouses pondering or in the divorce process need to have a decent understanding of what it means when an asset is subject to division, and specifically how the appreciation of a non-marital asset can still matter in final divorce settlement. Florida law authorizes the division of all marital property in the event of divorce, either by agreement of the parties or through a judge’s orders. Thus, determining what should be classified as marital is key to knowing how much is available in the marital pot for distribution. In Florida, any property acquired by either spouse during the marriage is typically considered to be part of the marital estate. Exceptions to this rule apply when non-marital property is used to purchase additional non-marital property or an individual spouse receives a gift or inheritance from a third party. However, non-marital property can be wholly or partially transformed into a marital asset if the property is used for the benefit of the marriage, such as providing the family a home, or is enhanced by or commingled with marital funds. This issue most commonly emerges when a piece of non-marital property appreciates in value during the course of the marriage, either through direct efforts of a spouse or by a passive increase in value. In both cases, the value of the appreciation is often subject to division as a marital asset. If the appreciation of the non-marital asset was active, meaning the couple was individually or collectively responsible for the increase in value, this amount should be divided as a marital asset. Ascertaining precisely what this amount is often requires the work of a financial professional, particularly if it involves a complex asset, such as real estate or investments. The division of marital property starts with the presumption an equal division is appropriate, but the facts of each case, especially in regard to appreciation of non-marital property, can change that ratio. This reality is highlighted when calculating the division of passive appreciation in non-marital real estate, which is now governed by Florida law. This rule applies to mortgages and notes paid with marital funds for non-marital homes or other properties. A specific formula is used to determine how much each spouse is entitled to receive, based on the marital portion of the passive appreciation, the amount paid down with marital funds, and any active appreciation. However, spouses can ask to deviate from this formula if it would unfair under the circumstances. Assessing the appropriateness of the formula and the division of marital property in general, is complicated and should be discussed with an experienced divorce attorney. Dividing your property in divorce is one of the more critical parts of this process, and if you have questions about how to obtain a fair settlement, speak with a divorce attorney today. You get one shot at forming a property settlement, so the stakes are quite high. The attorneys at the office of Baginski Brandt & Brandt know the pressure divorce brings and will work to get you the best possible outcome for your family. 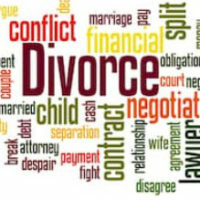 Contact the Port St. Lucie divorce attorneys for confidential consultation.